Reader Question: I currently own a set of watercolour pencils (from the makers of Derwent) and rarely use it for watercolour but just for colouring in. It has 24 pencils and after discovering Prismacolor, I want to invest in those instead. But is my current set good enough? Also I am only 12 but I love art and need it for school stuff too. Plus, do you have any ideas where I could purchase a Prismacolour set in the uk? If you have a set of Derwent Watercolour Pencils, then rest assured you have a good set. Derwent Watercolour Pencils are considered professional quality. In general, Derwent is a trustworthy brand that makes reliable, high-quality art supplies. You said you normally use your Derwent Watercolour Pencils for coloring in, which is fine and many people use them that way, without adding water. But I also encourage you to try adding water to your sketches to see what kinds of effects you can create. Watercolor pencils are fun because you can experiment with both drawing and painting. Who knows, you may enjoy the process of adding water to your drawings to bring out the watercolour qualities of the Derwent Watercolour Pencils. If you want to try Prismacolor Colored Pencils, check your local art supply store to see if they carry them. If not, they can be purchased on Amazon.co.uk - just ask your parents to buy them for you. If you can't find Prismacolors in the UK, consider getting a set of Derwent Coloursoft Pencils. Derwent Coloursoft Pencils are smooth and creamy, with rich, highly-pigmented colors that blend well together, so you can mix them infinite ways to create a whole range of colors. 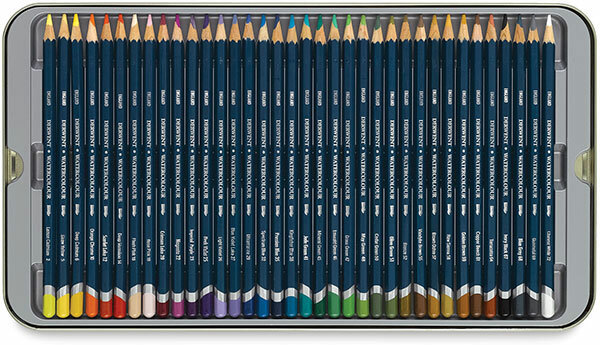 Derwent is a UK brand so it should be easier to find Derwent products in the UK, while Prismacolor is US-based. Some people actually like Derwent Coloursoft Pencils better than Prismacolor Colored Pencils, so you might want to try them for yourself and see what you think!